The Soviet Union came to a formal end in December 1991, leaving 25 million ethnic Russians living outside the borders of their nominal homeland. Today, ethnic Russians are a sizable minority in several former Soviet republics, and many are more favorably inclined toward Russia than are their fellow citizens, according to a recent Pew Research Center survey of countries in Central and Eastern Europe. 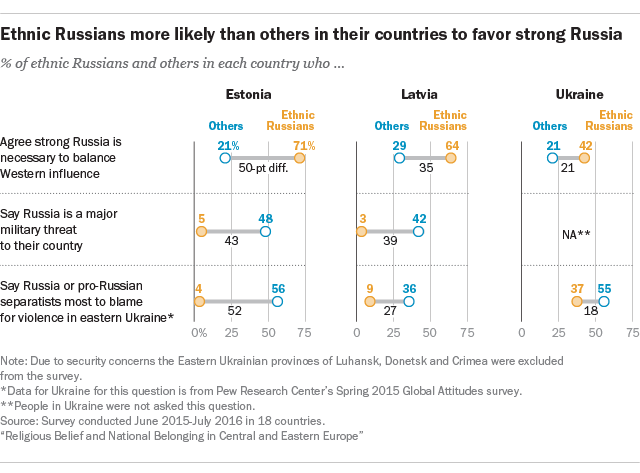 In Estonia, Latvia and Ukraine – the three former republics in the survey that are home, proportionately, to the largest ethnic Russian populations outside of Russia – ethnic Russians are more likely than the rest of the population to agree with the statement, “A strong Russia is necessary to balance the influence of the West.” At the same time, ethnic Russians in these countries are less likely to view Russia as a major military threat or to place most of the blame for violence in eastern Ukraine on Russia or pro-Russian separatists. The violence in Ukraine has raised concerns about potential Russian incursions in other former Soviet republics. The Center’s recent survey found that ethnic Russians are more likely than non-Russians in their countries to say that Russia has an obligation to protect ethnic Russians living outside its borders. In Estonia, for example, more than three times as many ethnic Russians as non-Russians hold this view (76% vs. 23%). More than two decades after the creation of their newly independent nations, substantial shares of ethnic Russians in Estonia (32%) and Latvia (24%) also say that they do not consider themselves citizens of the countries where they reside. And perhaps reflecting their minority status, ethnic Russians in the countries surveyed are more likely than their fellow citizens to say it is better if society consists of people from different nationalities, religions and cultures. (Within Russia itself, ethnic Russians are less likely than others to say society should consist of people from different nationalities.) There is also a nostalgia among many ethnic Russians in Estonia, Latvia and Ukraine for the Soviet past. They are more likely than non-Russians in these countries to view the dissolution of the Soviet Union as a bad thing. In addition, compared with their fellow citizens, ethnic Russians tend to be more favorably inclined toward Josef Stalin, one of the chief architects of the Soviet Union. By contrast, they tend to be less favorably inclined than others toward Mikhail Gorbachev, the leader who is often associated with the Soviet collapse.